Because we are leaders in this field and have shown many of your colleagues the hottest techniques that have improved the condition of even the most difficult client cases and dramatically increased their income within 1 year and we can do the same for you! The human body is composed of an intricate network of tissues and cells, all of which are exquisitely responsive to subtle electrical currents. All of our body functions and internal communications are regulated by such impulses, including healing and regenerative processes, and the immune system. Chronic pain and dysfunction is a signal of the failure of some aspect of the body-mind to communicate or process information or energy. Acutron technology was first developed in 1988 by Dr. Darren Starwynn and a team of engineers to address the need for highly effective, non-drug, pain management. Acutron Mentor’s remarkable effectiveness is based on its ability to apply specific frequencies, polarities and current levels of electrical energy required for each individual patient condition. The Acutron Mentor’s preset treatment menus make it very easy to select and administer effective treatments. 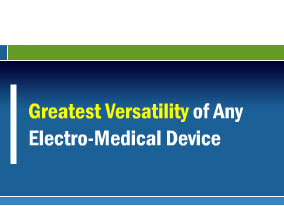 For this and many other reasons, the Acutron Mentor is recognized throughout the world as the leader in non-invasive electro-medical therapy. 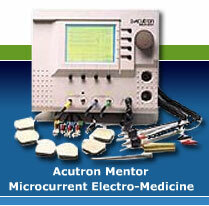 Eastwestmed therapy is at the heart of the Acutron Mentor. 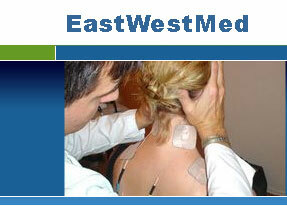 No other Eastwestmed device even comes close to offering the versatility and ease of use of the Acutron. For a complete explanation of the unique features and benefits of the Acutron Mentor, Click here. Acutron Mentor is used by acupuncturists, chiropractors, physicians, physical & occupational therapists, massage therapists, dentists, veterinarians, nurses, athletic trainers, health spa practitioners and more. While TENS units, interferential and other types of electrical stimulation devices for pain treatment have been commonly available for decades, their effectiveness record has been poor to mixed. This is because much of the original research these devices were based on viewed the human body in a mechanistic way, as is the case with so much of Western medicine. Few, if any, electro-stimulation devices, or the application techniques offered with them, address the most crucial aspects of successful pain treatment. Please see article Shortcomings of Electric Stimulation – And Solutions for details on the limitations of most current electro-therapy practices, and how you may derive far superior results.